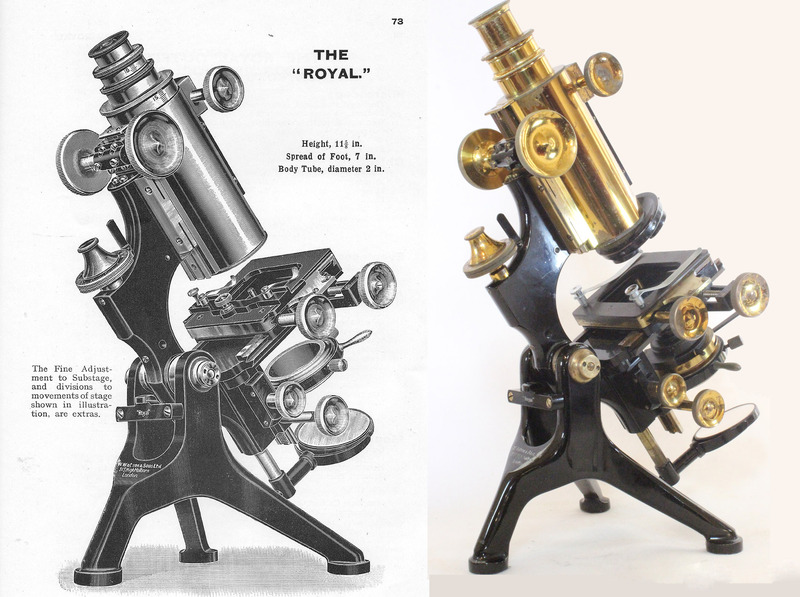 This is a later (1930) example of the 'Royal' microscope by W. Watson & Sons Ltd of London, identical to that pictured in the 1928 catalog. This massive stand includes a wide English style tripod foot, signed 'Royal' on the cross bar on its rear and also signed: 'W. Watson & Sons Ltd, 315 High Holborn, London.' The 'spread' of the tripod foot is about 6 3/4 inches measured from the outside of each foot pad to the other; the 1928 catalog reports the spread as '7 inches' but I know of other examples measuring 6 3/4 inches. Each foot pad is about an inch in diameter. The height in vertical position with all tubes racked down is about 11 5/8 inches (which is the exact height reported in the 1928 catalog). The huge main outer optical tube has a two inch diameter. 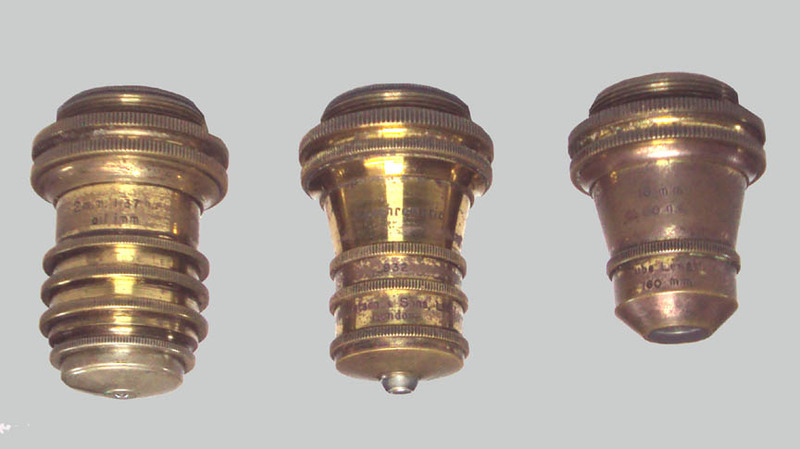 The outermost draw tube has a thread at its bottom to allow attachment of e.g. 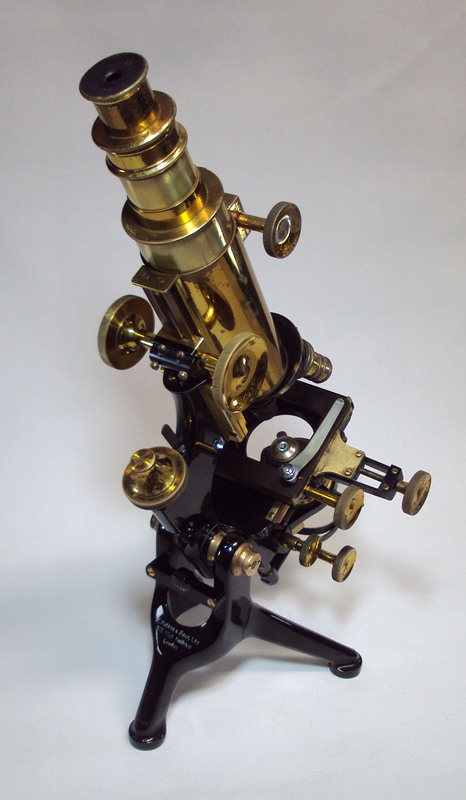 an erecting lens or analyzer. Both the racked draw tube and the innermost draw tube have engraved calibrations to adjust tube length. 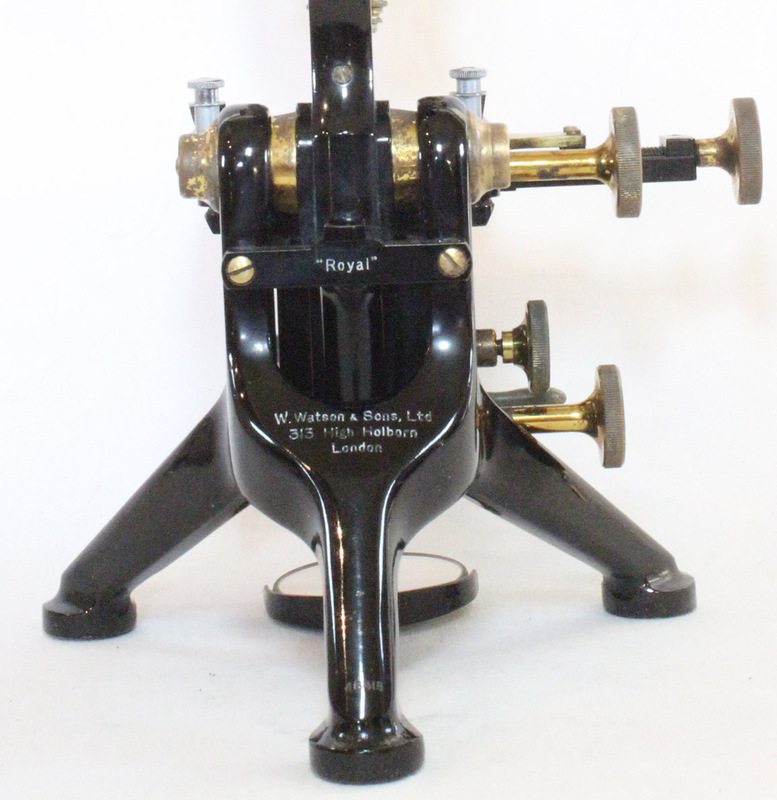 This example was provided with the 'standard mechanical stage' which was standard equipment for the Royal. 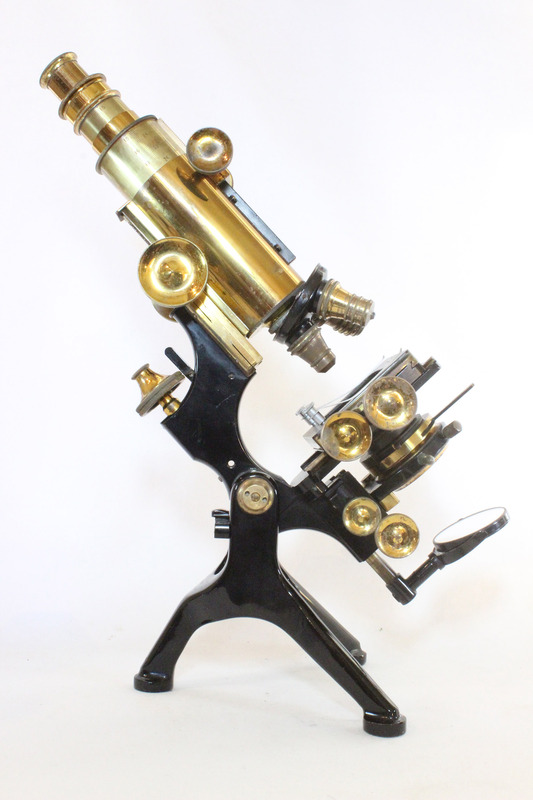 This example does have the (optional in 1928, standard later) substage fine adjustment and a set of 3 of the best objectives and eyepieces supplied by Watson at the time. 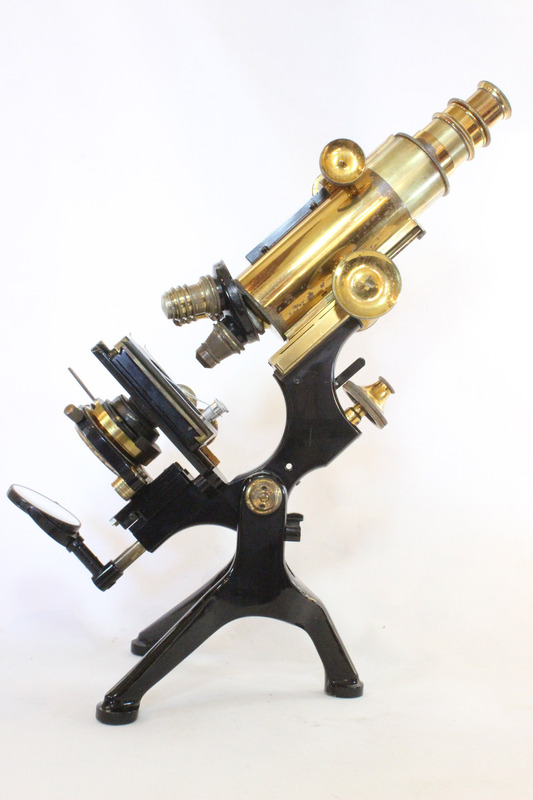 It is complete in the original case with achromatic holoscopic oil immersion condenser, and the magnification/warrantee card with serial number and date. It was also supplied with the optional triple nosepiece. One option that was not requested with this example was the calibrated scales to the stage. In addition, the stage has two (added) long stage clips instead of the rear-attached bar with short stage clips. 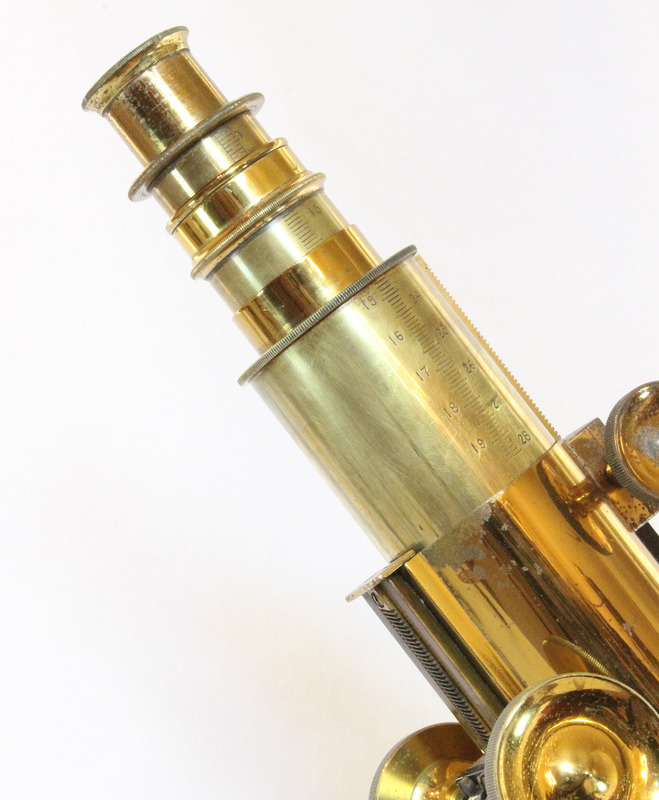 Two different styles of substage fine adjustment were available at the time and this one has the knob in a horizontal position below the stage, rather than the vertical substage fine adjustment often seen on some Van Heurk's. Even when ordering a Van Heurk, the user could choose either of these two styles of substage fine adjustment as an option as, although aggressively advertised, the substage fine adjustment was an option even with the Van Heurk. 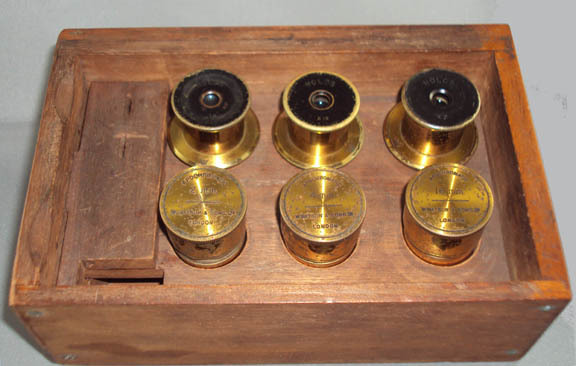 The three apochromatic objectives are a 2mm, 4mm and 16mm, complete with original cans and matching the magnification card. The original adjustable Holoscopic eyepieces include the 7, 10, and 14, also as noted in the magnification card. There is also a 20X Holoscopic eyepiece. 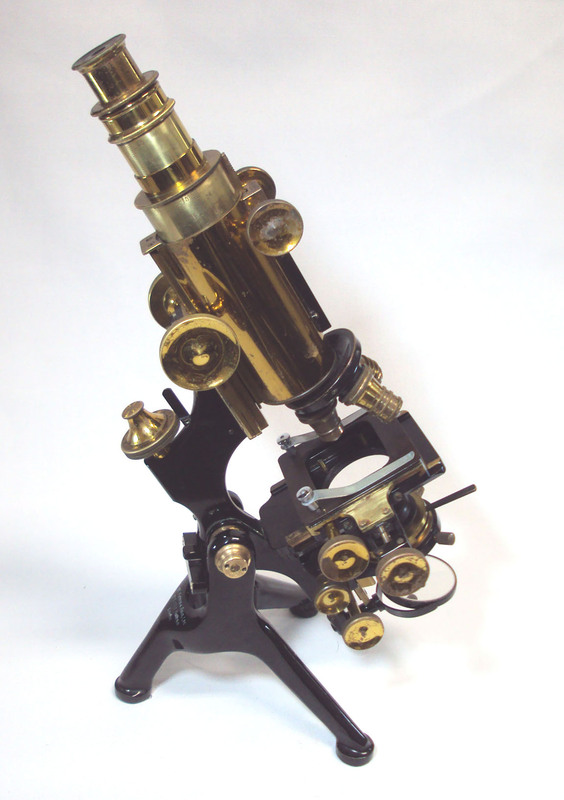 As noted on the magnification card, the scope was designed to work with a 160 mm tube length with these lenses. This tube length varied as in other years this tube length was different for Watson Apochromats. 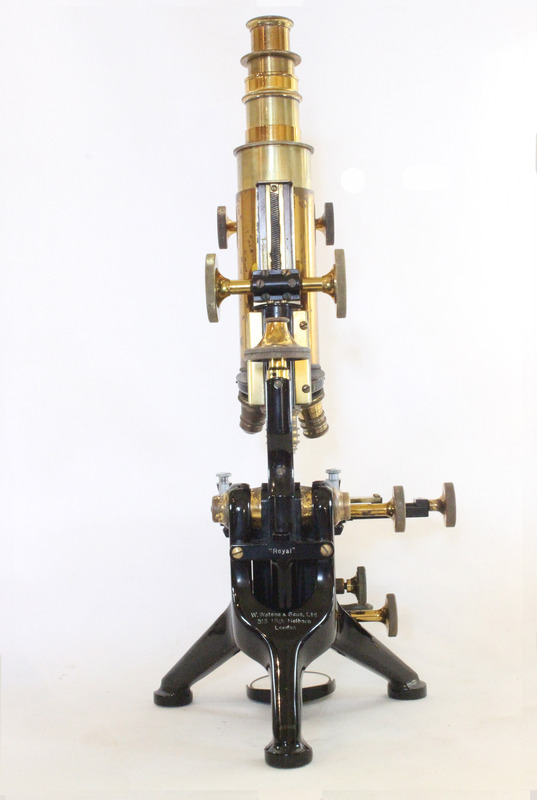 The other features of this stand include the standard plano-convex mirror, the centering adjustment to the substage, and the ability to swing the substage apparatus completely out of the optical axis, leaving only the mirror. The mirror is gimballed and its distance from the stage and the condenser can be lengthened or shortened via the rod which rides inside the tailpiece. 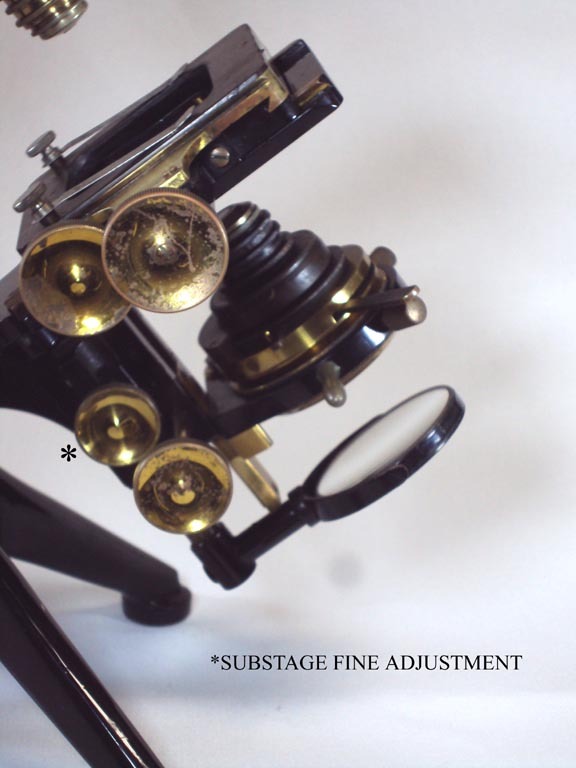 The substage condenser is the 'Holoscopic oil immersion Condenser' with N.A. of 1.30, of which the top element can be removed for lower power work. Indeed this is neccesary to get optimal illumination with the non-oil immersion lenses. 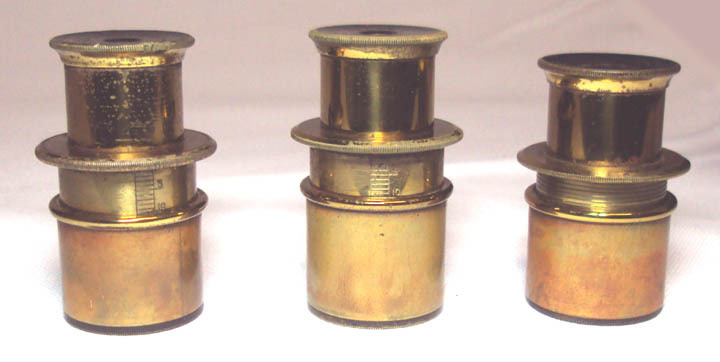 There is a slide out filter holder in this condenser and a full complete set of matching dark-field stops of various patterns, as well as a blue glass filter to fit; these fittings are found inside their original brass can. 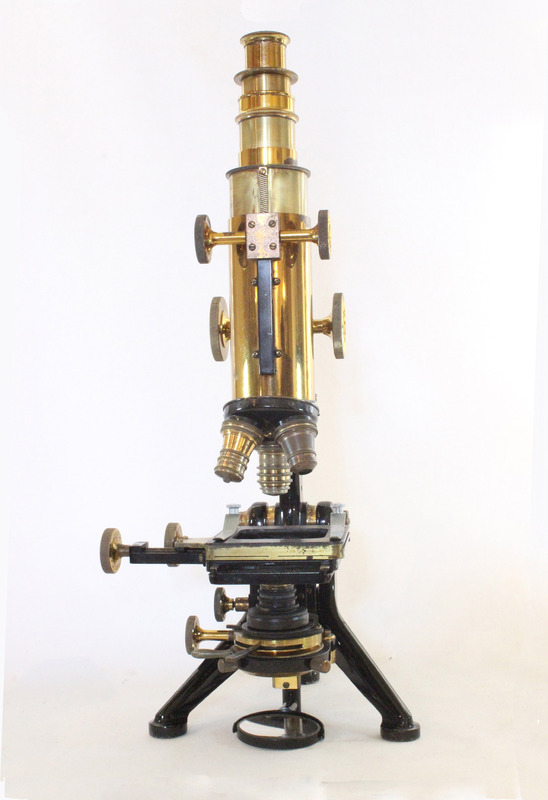 The condition of this microscope reflects some use; the lacquer is spotted in parts as shown in the pictures, but overall the instrument is still very attractive. Optically and mechanically, it is fully functional and the lenses are all clear and usable. It still works as well as it did in 1930, over 80 years ago. 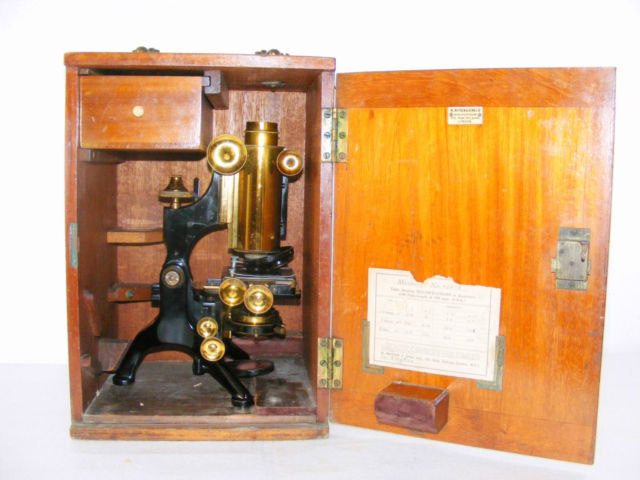 ..a Research Microscope of Medium Size... intended for those who require a microscope of the highest class... but not too large... in effect providing the advantages...which have gained so high a reputation for the Van Heurck microscope... but in a more compact form and at a lower cost. In reality it could be outfitted with nearly all of the features of the 'Number 1 Van Huerck. As noted above, the major differences between the 'Number 1 Van Heurck' and the 'Royal', is a slight difference in size-both height and foot spread. When racked down to its lowest level, the 'Royal' is 11 5/8 inches high (as on this example), and the 'Number 1 Van Heurck' 12 1/2 inches high, a mere 7/8 inch difference. Similarly, the spread of the tripod foot for the 'Royal' was reported as '7 inches' (the actual measurement for this and other examples is 6 3/4 inches). The 'Number 1 Van Heurck' has a reported spread of 7 3/4 inches or one inch wider. Thus the 'No 1 Van Heurck has a 14% wider spread and is 7% higher. The other difference was the rotational movement of the stage for the Van Heurck. 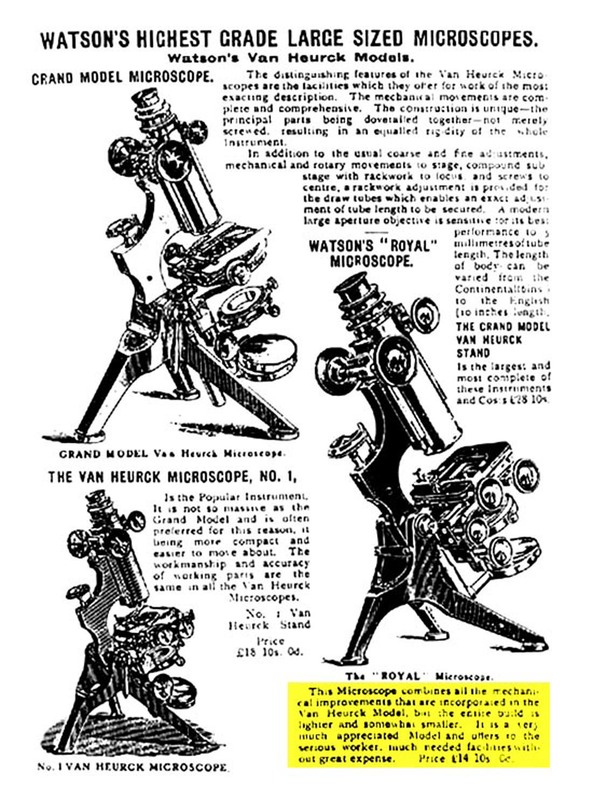 In the 1928 catalog virtually all other features for the Number 1 Van Heurck could be ordered for the 'Royal.' Another small difference, is that although fine adjustment to the substage was an optional feature of both the Royal and the Van Heurck, it was apparently only available as a substage control for the Royal, while on the Van Heurck, the purchaser could specify the substage location, or, for a higher cost, the vertical control projecting from the right rear side of the microscope near the stage. In summary the Van Heurck was slightly larger, had rotational movement to the stage, and as an option, could have substage fine adjustment control which could project vertically above the stage if desired, although it could also be supplied as a below the stage control. All optical components were interchangeable. Some readers may wonder if the rack and pinion adjustment to the draw-tube was limited to the Royal and the Van Heurk. 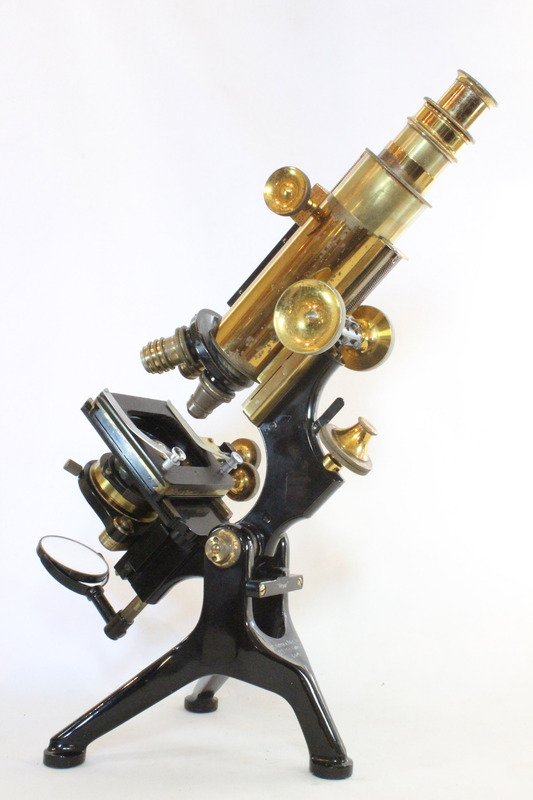 In general this was true, but it was apparently an option that was occasionally added to the Edinburgh stand, and a separate mechanical draw tube with a rack and pinion adjustment, could be purchased separately to replace the simple draw tube of other microscopes Watson offered. The option of a rack and pinion draw tube dates back to the early 1890's. The entire outfit, as equiped here, would have cost (according to the 1928 catalog), 93 65 00. This would be about 4,400 GBP today or about $7116. This was not a cheap instrument, especially in the Great depression!